As an alternative to conventional treatment steps, such as flocculation, sedimentation and multi media filtration, 3M Liqui-Flux Ultrafiltration Modules reliably remove turbidity, suspended solids, and pathogens such as bacteria and protozoae from a raw water stream. 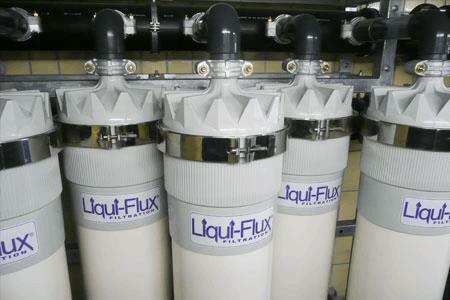 Even if the inlet water quality is inconsistent, a very high quality outlet can be achieved using Liqui-Flux modules. UltraPES™ hollow fiber membrane is the heart of the 3M Liqui-Flux module. It is made of polyethersulfone and consists of a distinctive 3-layer morphology that provides superior permeability and strength. To provide long-term durability the membrane is stabilized by our Multifiber P.E.T Technology. The 91m2 Liqui-Flux® Ultrafiltration module features an advantageous design, which represents one of the largest ultrafiltration modules of its kind with an inside-out pressure driven technology. The hosing design enables a flexibility system design. The Variable Connect Concept - VCC™ allows endcaps with radial or axial ports to be interchanged to meet even the most difficult space and design requirements.